What Legal Expenses Can I Claim As Tax Deductions? When a legal expense is incurred in relation to the operation of a business to produce assessable income, it is generally allowable as a deduction. Exceptions are when the legal fee is capital, domestic or private in nature, if it is specifically excluded by another section of income tax legislation, or is incurred in earning exempt and non-assessable non-exempt income. For individuals incurring legal fees, the expense incurred would not be deductible unless there is a clear connection with the expense being incurred in deriving assessable income (for example, for an investment property). In other cases, the expense may be private in nature so a deduction would not be available. The following legal expenses are not deductible under the general deductibility provisions because they are of a capital or private nature. Preparation of an income tax return. Disputing of a tax assessment. Obtaining of professional tax advice. Please ask us if any of the above is relevant to your tax affairs. Business lease expenses – The cost of preparing, registering and stamping a lease is deductible if the taxpayer is using or will use the property for earning assessable income. The lease payments themselves will be deductible under the general deduction rules, and are therefore subject to special prepayment rules (ask us for more information on this). Valuation expenses – If valuation fees are paid to help decide whether to buy a business, these are generally capital costs and not an allowable deduction. However if the valuation is used to support an application to borrow money for use in the business, those expenses can be claimed as borrowing costs immediately if under $100 or over the life of the loan, or five years from the date of the loan, whichever is shorter. Fines and breaches of law – Deductions are specifically denied for fines or penalties (however described) that are imposed as a consequence of a breach of any Australian or foreign law. This rule does not apply to administratively imposed penalties such as general interest charge (which the ATO applies to unpaid tax liabilities) and penalties for underestimating GST instalments. However, while the fines and penalties may be specifically disallowed, the costs incurred in defending the action may be deductible. Evicting a tenant – A taxpayer may acquire premises (all or a portion of) that were leased to a tenant of the former owner. Any expenses incurred trying to evict the tenant will not be deductible. This expense becomes part of the cost of acquiring the property and a capital expense for income tax purposes. Arguably, the expense could form part of the “cost base” of the property, being expenditure of a capital nature incurred in establishing the taxpayer’s title to, or a right over, the asset. Talk to us if relevant to your situation. Negotiating current employment contracts (including disputes) in respect of existing employment arrangements. Defending a wrongful dismissal action bought by former employees or directors. Defending a defamation action brought against a company board. Recovering misappropriated funds of the business. Opposing neighbourhood developments that are likely to adversely affect the taxpayer’s business (depending on the facts of the case). Recovering wages of an employee as a result of a dishonored cheque. Defending a libel action provided the case was directly related to comments in pursuit of the company’s business. Pursuing claims for workers compensation. Defending the unauthorised use of trademarks (depending on the facts of the case). Cost of negotiating employment contracts with a new employer. Defending driving charges (regardless of whether the transgression occurred while driving on company business). Defending charges of sexual harassment or racial vilification that occurred in the workplace. Eviction of a tenant whose term had expired. Resisting land resumption, rezoning or disputing the amount of compensation. Disputing redundancy payout or seeking to increase the amount of any redundancy payout. 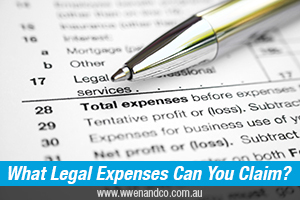 As you can see, the task of determining whether a legal expense is deductible can be tricky.